most frequently used kitchen gadgets are all within easy reach. become more convenient than the regular cooking range! Victory! 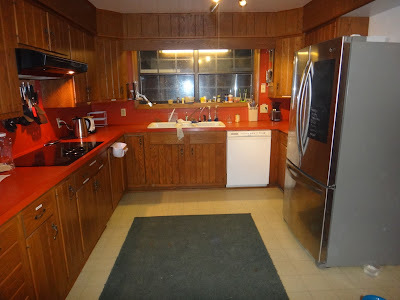 Today a wonderful long-time Veteran's advocate named Judy came to inspect the premises, and almost the first thing she said upon walking into Valhalla's Main House was "Oh my heavens, you have a commercial kitchen!" Well, not quite yet... but after hundreds of hours of DIY effort, Valhalla now has a kitchen with almost all of the facilities and equipment necessary for producing restaurant-quality meals for dozens of people at a time. interested post-9/11 Army combat veterans as well as some of the civilian war zone workers who served with them about excellent gourmet food that they can make themselves. 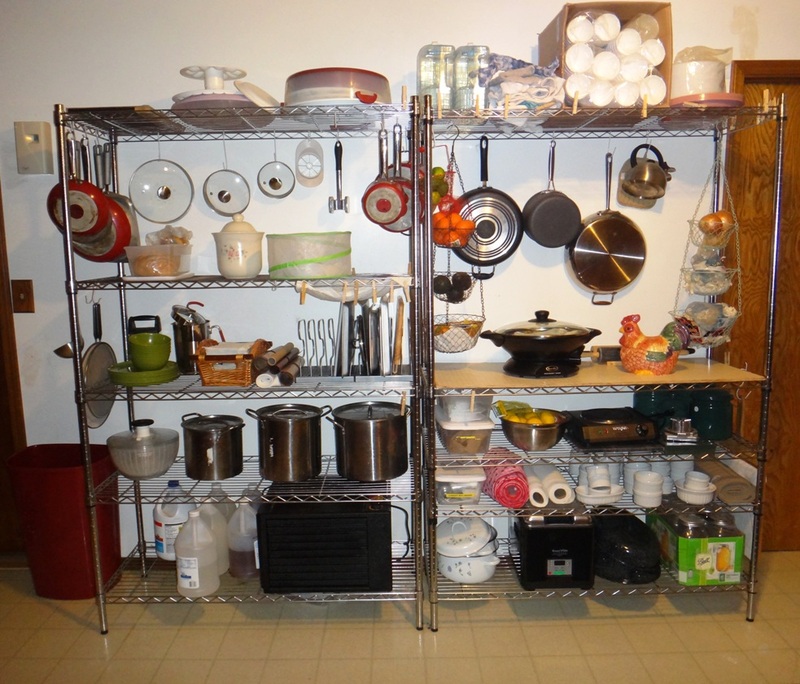 shelving unit on the left is also used as an oversized cooling rack. counters clear, a very practical and convenient arrangement. 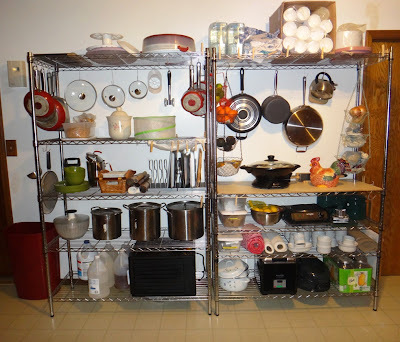 Two open shelving units are used to keep essentials in plain sight that does triple-duty as both cooling and drip-dry racks. 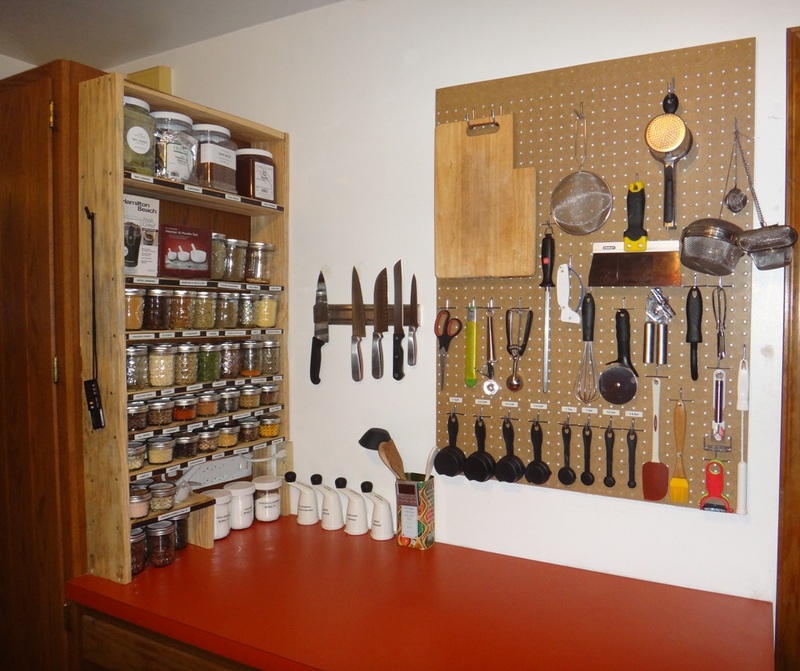 Our goal is for any new Valhallan to walk into the kitchen and immediately see where things are, and have the tools as well as ingredients necessary for preparing wonderful meals with the least hassle possible. We've gone a lot farther than that to help make this possible even for those who are uncomfortable with cooking or even being in a kitchen, but that's another story for another time! 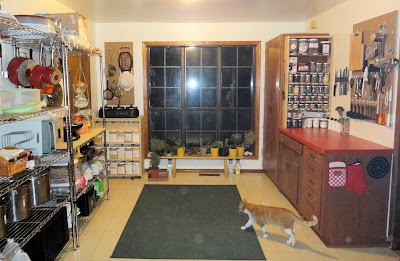 that make food prep and cooking a lot easier and more enjoyable. Yes, the 1970s era orange countertops, dark cabinets, and ancient linoleum floors are quite awful yet still perfectly functional, while replacing them would cost thousands of dollars. We decided that we'd take that same money and invest it into a wide variety of specialty appliances for Valhalla instead; it's much better to buy what is really needed than have a stylish kitchen that doesn't have all the things that you need to make cooking easier and more enjoyable! several cooks at the same time. 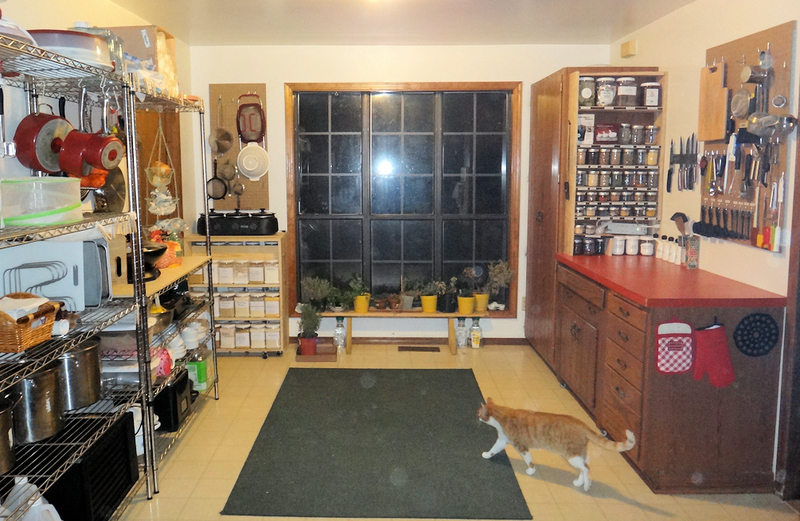 There's something else that would be much more practical and desirable then new counters, cabinets, or floors: an oversized custom-built bay window with glass shelves for growing herbs and seedlings in the winter, with a full-sized stainless steel sink. Having sinks on both ends of the kitchen would effectively create two kitchens where several people can be cooking all at once. Every nook and cranny in Valhalla's kitchen has to work hard since space is so limited, so the other day I built a flour vault out of some 1x6s. 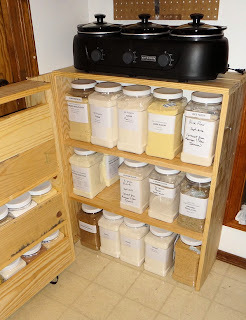 Small canisters of specialty flours and other baking necessities (baking soda, salt, cocoa, etc.) are kept on the front door of the unit, with the door mounted on wheels to help support the weight. Inside there's enough room to store 150 pounds of flour, sugar, and grain - pretty impressive for a small 29" x 17" space! Inside of the flour vault. As part of Valhalla's frugality program, baked goods are almost always made from scratch here onsite and ingredients are purchased in bulk to save money. 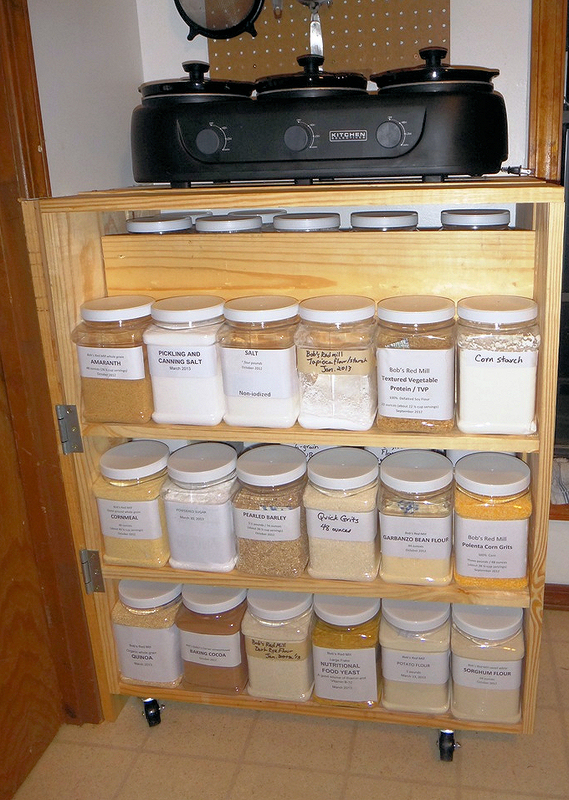 Flours and grains are immediately repackaged into air tight containers with oxygen eater packets, not just to preserve freshness but also to lock out any insects or rodents.